* Is there such a thing as a just war? * What are the moral issues surrounding genetic engineering? * Is it ethical to create babies for infertile couples? * Can it ever be right to help someone else to die? * Is the death penalty justified? * How can we care for the environment? * What about animal rights? * What are the challenges of globalisation? These are some of the central issues addressed in this book. The author introduces the issues and the questions surrounding them and offers his own perspective. This book follows on in series from A Pocket Guide to Sects and New Religions (2005) and A Pocket Guide to the Bible (2004). 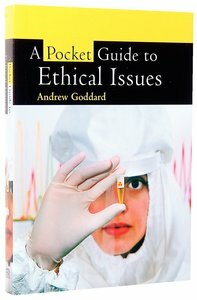 About "A Pocket Guide to Ethical Issues"
Is there such a thing as a just war? - What are the moral issues surroundingenetic engineering? - Is it ethical to create babies for infertile couples? Can it ever be right to help someone else to die? - Is the death penaltyustified? - How can we care for the environment? - What about animal rights? What are the challenges of globalisation? These are some of the centralssues addressed in this Pocket Guide. The author introduces the issues andhe questions surrounding them, offers his own perspective and helps readerso make up their own minds. Follows on in series from A Pocket Guide to Sectsnd New Religions (2005). How can we think clearly and responsibly about key ethical questions? This is a handy introduction to a subject of interest and concern to many people. It provides concise coverage of some of the central ethical issues and helps readers to make up their own minds. Revd Dr Andrew Goddard (D.Phil., University of Oxford) is Tutor in Christian Ethics at Wycliffe Hall, Oxford. In recent years he has played a significant role in the Anglican Communion debates on homosexuality and the nature of communion. He is the editor of Anvil, the Anglican evangelical theology journal and a Fellow of the Anglican Communion Institute. He is on the Faith and Order Advisory Group of the Church of England, the leadership team of Fulcrum and the Evangelical Alliance's Commission on Unity and Truth among Evangelicals.Andrew continues to write and speak on matters relating to the Anglican Communion and to sexuality and with Elisabeth (his wife) he is delivering the London Institute for Contemporary Christianity Lectures in 2006 on Redeeming Family, to be published by IVP in 2007, he has authored A Pocket Guide To Ethical Issues, Living The Word, Resisting The World and The Moral Leader (with Bishop James Jones).